Beneath the Gown: Stars, They're Just Like Us: They Go to the Hospital, Too! Stars, They're Just Like Us: They Go to the Hospital, Too! (First a NB: the posting "ID, Please" has somehow been corrupted, and a large chunk of it is missing. I cannot retrieve nor remember the lost text, but rest assured it was hilarious and poignant. I also can no longer even edit that post--so much for the power of the Internet. Thanks for nothing, Al Gore! I was blithely going to post some joke about how he was probably at UCLA for his weekly visit to the maternity ward (hint hint). I congratulated myself on my own boundless cleverness. Holding a young child, and with a very normal-seeming, non-celeb woman. Was the child in fact his? Was the child sick? And who was this mystery woman? It was almost 9:00 pm by then. And it occurred to me that nobody spends eight hours in the hospital if things are okay. And I was overcome with a sense of shame that I'd even considered revealing this huge movie star's identity, as though he somehow had a lesser right to privacy than anyone else. He was likely dealing with something significant and troubling, and I could not casually out him and discuss it, much less try to make light of it. 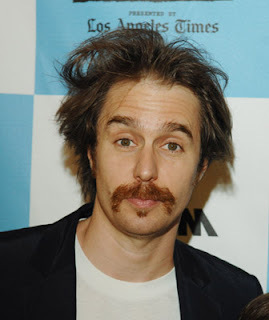 Sam Rockwell, whose work I've enjoyed since "Lawn Dogs." Mr. Rockwell, shown here in character as Albert Einstein, whom he'll be portraying in "It's All Relativity to Me!" He was with a foxy blond woman whom I didn't recognize, but who the Internets suggest was Leslie Bibb--a fellow talented attractive celeb. And they were with one set of parents. Then, after dinner my mom and I headed to the adjacent pet store and saw them there, as well. Parents...pets...sushi? Can wedding bells be far off for Sam Rockwell and Possibly Leslie Bibb? Stay tuned, Dear Readers, as the answer shall be revealed in my next post! Yes, I am a third year at UCLA paying ridiculous rent to live on Gayley so I can walk to campus. I'm sure your stay in Westwood was similarly costly. Anyway, I'm glad to hear that you have made it home and are doing well. It's funny that I've become invested in your situation just from my chance encounter with your blog. I think that speaks to how wonderful a writer you are. It's really a privilege to read, and I'm going to subscribe. I'm actually an English major, supposed to be studying for finals right now, but your blog is a lot more interesting reading than anything I've been assigned. So sorry for the incredibly sluggish response! And thank you so much for your kind words about the blog, and for your concern. I truly appreciate it. I think the blog was definitely a sanity-preserving mechanism while in the hospital. Although I am chagrinned that--now that I'm out--I seem to have so little to say. Maybe that's a good thing. Maybe I'm busy living my life instead of self-consciously blogging about it? Then, of course, there's the less romantic fact that the recovery is just boring: taking IV antibiotics that make me kind of sleepy and (more) dimwitted, putzing around my apartment. What are you reading that's so boring? I hope finals went well. What area of lit are you going to concentrate on? Senior year will be better.